Normally it's best to not incur the wrath of Apple, but then again maybe China Telecom knows something the rest of the industry doesn't. Apple has yet to officially unveil the iPhone 6, but that didn't stop its Chinese carrier partner from posting to the Asian social network Weibo about the new iPhone, according to Sina Mobile News. The post included the image you see below, as well as a tiny bit of new info about the iPhone 6: that the new Apple phone will feature a multitude of radios and be compatible with wireless networks that include TDD-LTE, FDD-LTE, WCDMA, CDMA2000, GSM, and CDMA1X. In addition China Telecom confirmed that it will sell an unlocked iPhone 6 compatible with multiple Chinese carriers. Perhaps more interesting, though, is the image that came along with these details. If this is the official branding that carriers will use to promote the iPhone 6 once Apple does announce it, then it looks like all the previous rumors about a rounded design and a side power/lock button were accurate. 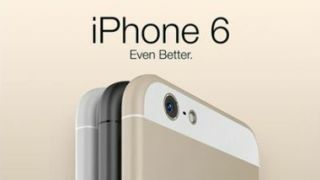 The iPhone 6 is expected to come in two variants, one with a 4.7-inch display and the other at 5.5 inches, and actually be announced by Apple on September 9. It's unknown whether Apple has any system of penalization in place for partners who jump the gun on massive announcements like this. But if China Telecom disappears from its home one night and is never seen again, we'll know the reason why.